Got a new Instant Pot? Welcome to the most popular kitchen gadget! 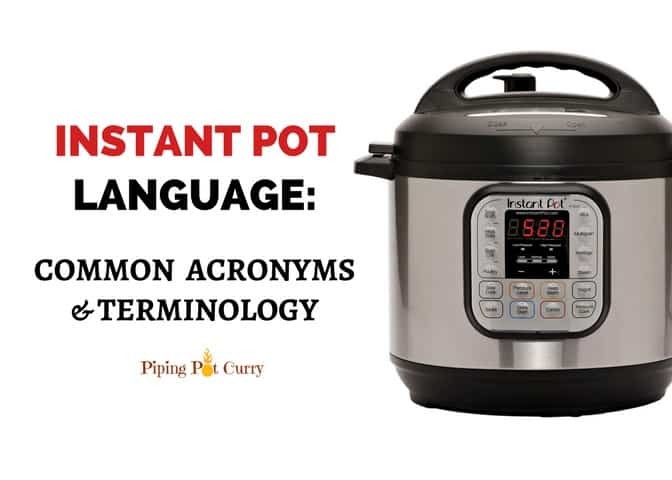 For the new Instant Potheads, I am sure you are overwhelmed with all the new acronyms you have seen in the Instant Pot groups on Facebook or when you search for a recipe. 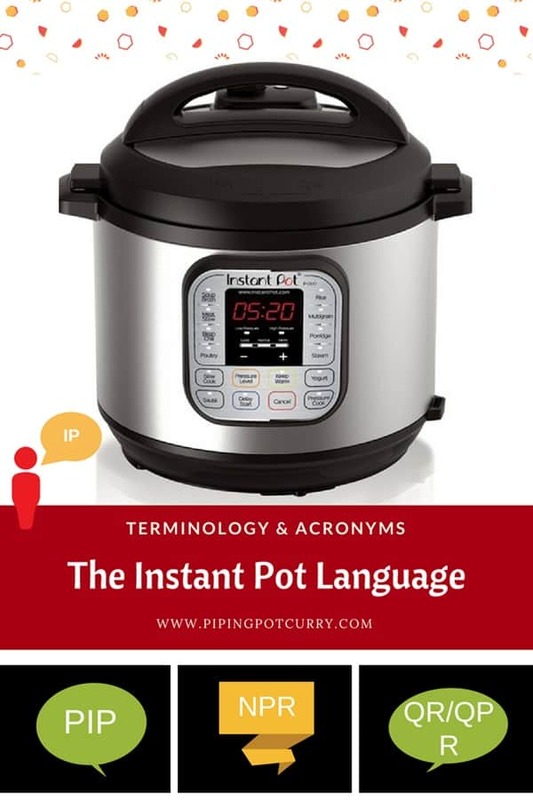 Instant Pot has certainly added a new lingo. So let’s get started to learn some of the commonly used terms. 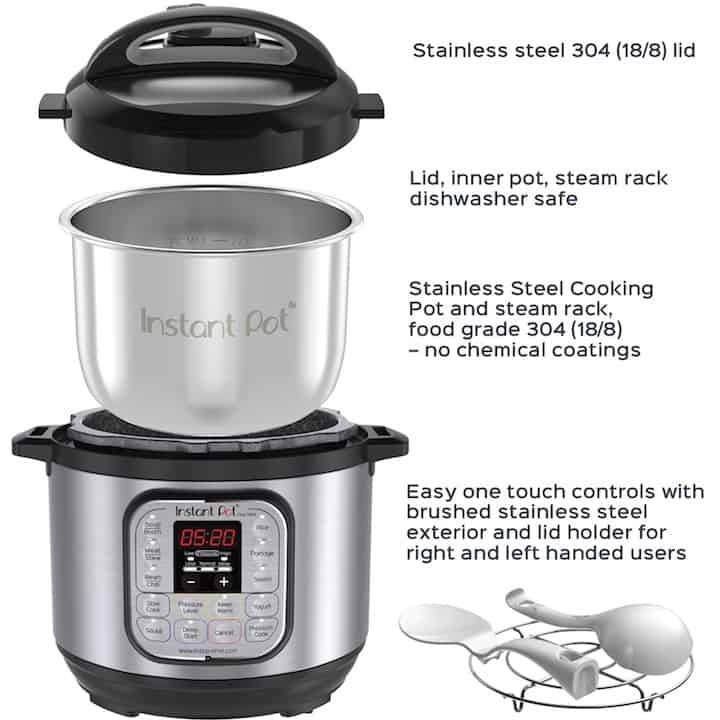 If you have not already setup your instant pot and done the water test, check out the Instant Pot Beginners Quick Setup Guide. When pressure cooking is done, let the instant pot release the pressure by itself until the pin drops. Do not change the pressure valve position. When the pressure cooking is done, release the pressure by moving the pressure valve to venting position. Wait for the pin to drop before opening the instant pot. Quick release is not recommended for foods with large quantities of liquid, as food can splatter out with steam. 8. X minute NPR = Do natural pressure release for X minutes, then do a quick release. You will see this used often as “5 minute NPR” or “10 minute NPR”. A 10 minute NPR means you release the pressure manually 10 minutes after the instant pot beeps. This method is used by many to cook multiple dishes at once or if you are cooking a small amount of food. For eg. Cooking meat or a curry in the main pot, while cooking rice in a oven safe or steel pot kept on a trivet. Many people have made 3 things at a time in the instant pot using stackable containers. See the post to cook rice with the PIP method. This is mainly used for cooking eggs. It means high pressure cooking for 5 minutes, then 5 minute natural pressure release and then 5 minutes ice bath. People use different methods to cook the eggs based on their texture preference, 4-4-4 or 3-5-5. 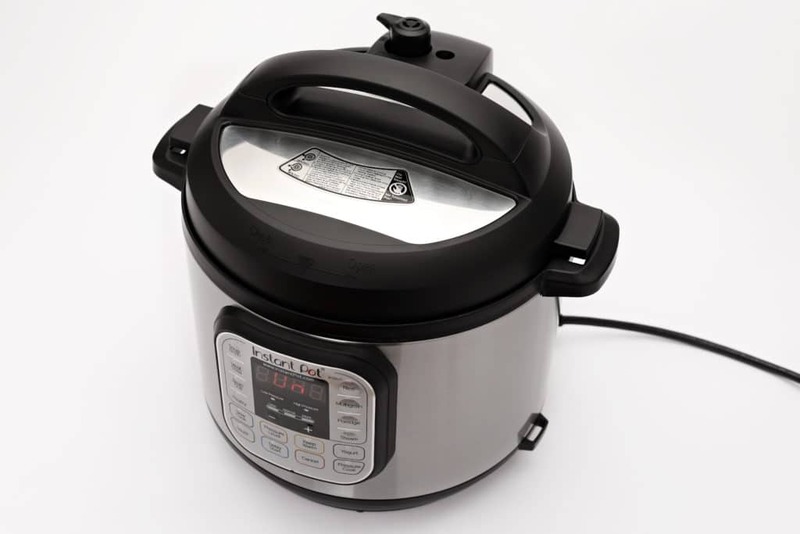 The older models of instant pot had the button to pressure cook named “Manual”. However in the newer models they have fixed this and now call it “Pressure Cook”, which is what it always did. After pressure cooking or slow cooking, the instant pot will keep your food at a “Keep Warm” temperature. This is shown on the display as L0:01, which means that the pressure cooking was completed and it has been 1 minute on Keep Warm mode. The counter will count up. You can choose for the instant pot to not go into Keep Warm mode after cooking by pressing the pressure cook/manual twice (the light on keep warm/cancel will turn off). You can also always press cancel after cooking to come out of Keep warm mode. This message is displayed on an Instant Pot Ultra when pressure is detected in a non-pressure cook setting or the temperature is found higher than the boiling point. eg. when you are sautéing and then put the lid on. The temperature is already high due to sauté mode, and the pressure gets built as soon as you put the lid. This is a warning that you should keep the lid off and if the lid is on, the pressure valve in venting when in a non-pressure cooking program. The exterior pot is the outer brushed stainless steel exterior. You place the inner pot in this exterior. The liner is the removable 3-ply bottom stainless steel cooking pot. Most of the time you will be cooking in this steel insert. It is dishwasher safe. You can purchase an extra one for more flexibility: Steel and Ceramic non-stick inserts. The Instant Pot Lid has multiple parts: Silicone Sealing Ring, Venting Knob, Floating Valve, and Anti-Block Shield. Tip: Look for the triangle markings to close the lid. The triangle mark on the lid and the housing should align for the lid to close. When pressure cooking food, all the parts must be attached and the lid secured. You can purchase a glass lid for the instant pot, which can be useful with slow cooking, yogurt function or when using Keep Warm mode. You can also purchase a silicone lid for the instant pot, which can be useful if you want to store food in the insert itself. Instant Pot recommends to not pull the sealing ring by force, as it can cause deformation and affect its function in sealing the pressure. It is a great idea to have a spare sealing ring at hand. It is also suggested to have one for cooking sweets, while another for cooking savory dishes, so that the odors don’t cross contaminate. Instant Pot sells a set of two, red and blue, so you can easily distinguish the savory and sweet foods sealing ring. 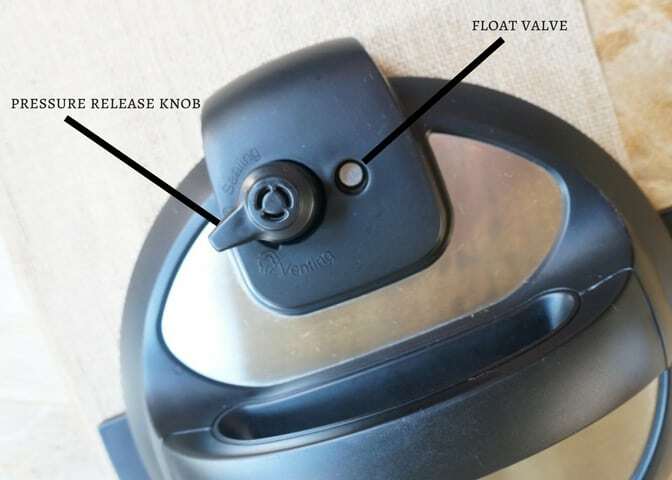 Vent is the handle on the instant pot lid that you turn to either the sealing or venting position. This can be removed for washing, however does not need washing after every use. This is the pin that pops up when the instant pot builds pressure. After cooking, only open the instant pot lid after the pin has dropped. The pin being up signals that there is still pressure inside the pot. There are two designs for the anti-block shield in different instant pot models. It is one if the safety mechanisms that helps prevent food from entering the venting knob. It can be removed by pushing it on the side and lifting up. I remove it only for cleaning. 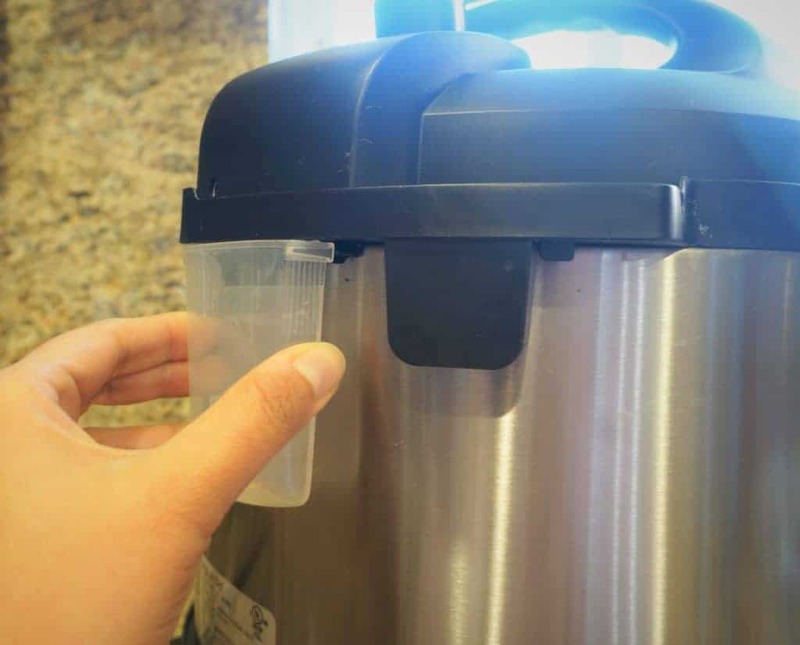 This is a small flat plastic cup that comes with the instant pot. It collects any drippings from the food being cooked. I have seen liquid collect in it, when the pressure did not build properly. The slot to put it is at the back of the instant pot. Depending on what you are cooking, make sure the venting knob is in the right position. Sealing Position: Traps the steam in the pressure cooker and builds up the pressure. This is the position you want to use for pressure cooking. Venting Position: Turn to venting position to release the stem after pressure cooking. This is the metal rack that you put inside the instant pot to keep food out of liquid such as for steaming and pot-in-pot cooking. Sometimes you might need a steamer basket to place on the trivet. 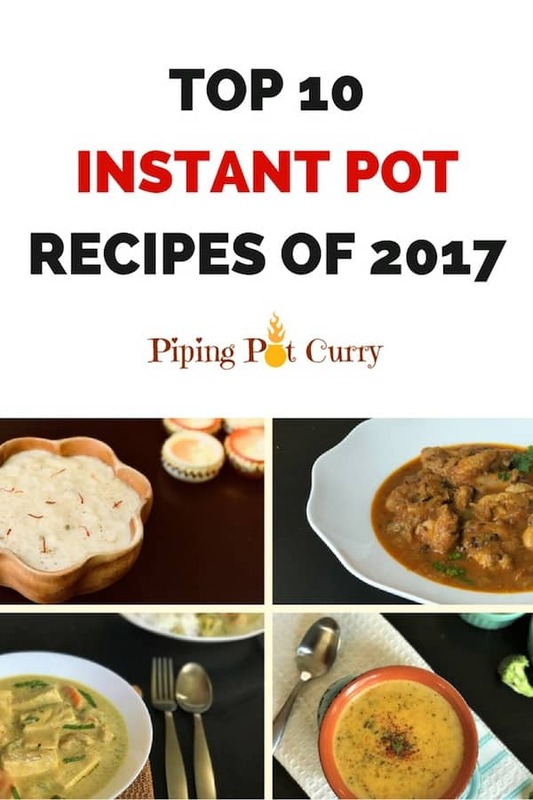 Here is a popular one among instant pot users. This is a recommended step to get you a feel for how the instant pot works and makes sure your pot is functioning as expected. It only takes 15 minutes, so I recommend to do it. Check the manual for details. If you have already started cooking and your food is cooking as expected, then don’t worry about it. “Burn” shows up when something has burned and scorched the bottom of the pot due to insufficient amount of liquid required to come to pressure. You can open the pot, scrape the bottom of the bowl and clean it off. Pull out the bad parts of the food that burnt, and start over with more liquid. This the the method of getting the browned food bits off of the bottom of the pot after browning meat/onions/garlic/etc. You add broth or water, scrape and stir the bottom of the pot until all the food bits are mixed into the liquid. We certainly hope this list gets you started off with the instant pot! To get you started with your new instant pot, check out 10 Easy Instant Pot Recipes for new owners. PR Se and a beeping at the same time. I would be enormously grateful to know, as I can’t find the information anywhere! Glad you found the information helpful. Great question Fran. It seems this message is displayed on an IP Ultra when pressure is detected in a non-pressure cook setting. eg. When you are sautéing and then put the lid on. The temperature is already high due to saute mode, and the pressure gets built as soon as you put the lid. However this is not the right way to pressure cook. You want to cancel saute. Then put on the lid (you might need to turn the valve to venting), turn valve to sealing and set to pressure cook. Hope that helps! Note: I have a DUO, so have not experienced this. But found this info on a FB group where someone shared a response from instant pot support.